Join us for the 2018 Annual Meeting and hear about all our accomplishments of the last 12 months and the exciting things to come in the next year. We will be meeting at Harmony Hill Farm on North Pond Road in Warren, just around the corner from Beth’s Farm Market. All members and prospective members are invited! Our speaker, Richard King, is the senior lecturer in Literature of the Sea with the Williams-Mystic Maritime Studies Program as well as an accomplished writer. His interest in cormorants began in 1998 when he read an article about the slaughter of 2000 cormorants off Henderson Harbor, NY. After reading the story he wanted to know why there was a disparity between how these people despised cormorants while others valued them immensely. He decided to use the double-crested cormorant as a case study and traveled all over the United States and the world to get a better understanding of the historic relationship between people and these birds. His travels included the Muscle Ridge islands in Knox County, Maine. 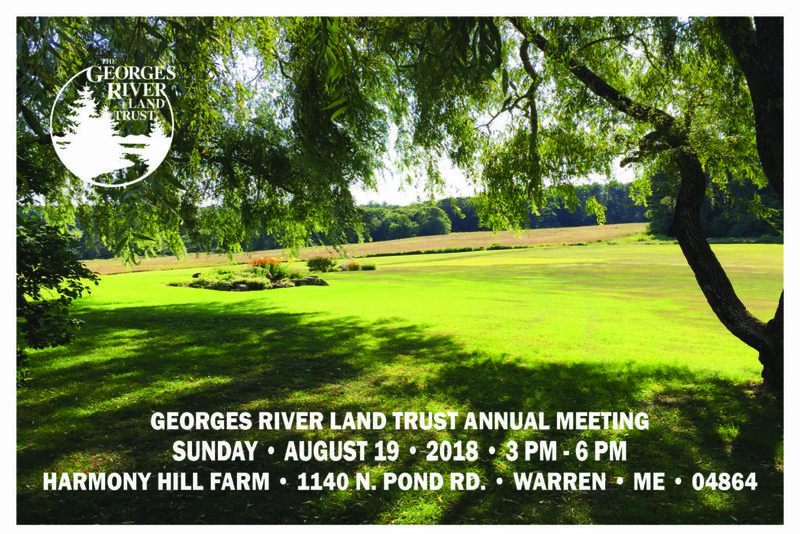 As in previous years, we will celebrate our Land Trust community with a potluck meal. We hope your gardens will produce a wonderful bounty so you can bring a dish to share. The Land Trust will supply beverages. Looking forward to seeing you!